Today I have a little Easter project to share with you. 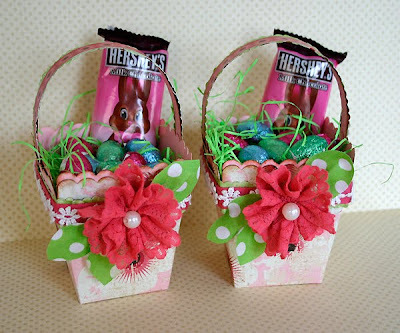 I was inspired to create a pair of mini baskets, one for each of my nieces, using their favorite color PINK! 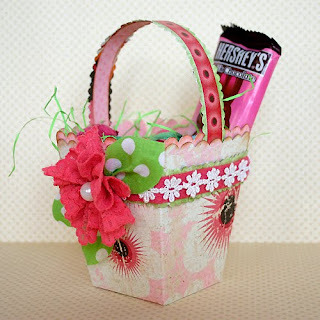 You can never go wrong with pink and chocolate right now with them, so I am pretty sure they will love these little baskets. However, I won't be surprised if they want more chocolate than what the baskets are holding! LOL!!! If you are interested in creating your own little baskets, keep scrolling. The supply list, instructions and even my Gypsy file are available below! 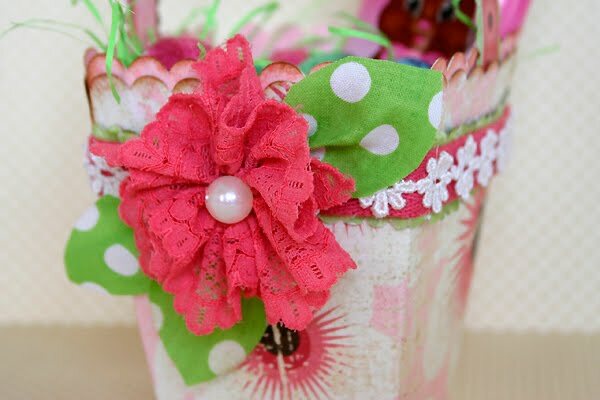 Create the handle by cutting a 1" strip of Loverly and then trim the edges with scalloped decorative scissors. Add the flowered border sticker and then attached the handle between the two basket layers. 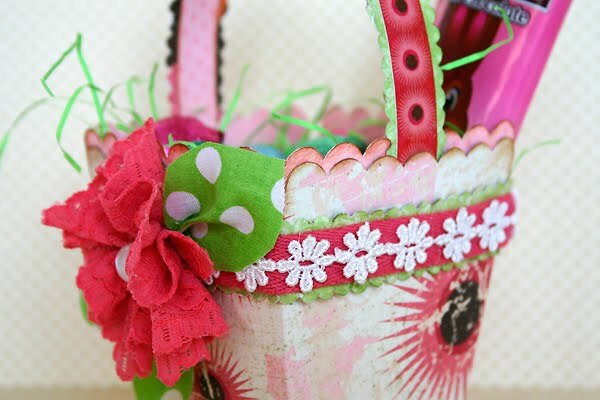 Embellish the baskets with the Vicki B wraps and flowers. Create the leaves for the flowers using the green polka dot fabric which is one of the Vicki B Wraps. Cut the fabric into petals shapes and then scrunch the tip and hot glue it behind the flower. Fill the basket with "grass" and chocolate and you are ready to go! If you are looking for more Easter treat holders ideas, check out the Bo Bunny blog today. I am sure you will be inspired when you see what the rest of the Bo Bunny design team has to share with you! Lastly, before I go, I wanted to share a little scoop with you regarding a fabulous class you can take. Heidi Swapp & Jessica Sprague are teaching a class entitled Mouse, Paper, Scissors: MOM and they will be using...get this...Bo Bunny's gorgeous Gabrielle collection!!! During the class they will be creating a stunning Mother’s Day Card, a 2-page interactive scrapbook page layout and a mini-book. The class runs from April 18-29. For more details, stop by Jessica Sprague's website. A direct link to the class can be found HERE. Thanks so much for stopping by today! And as always I enjoy your comments and if you ever have any questions, please just ask! I am L O V I N G those little treat baskets! Absolutely adorable! I'm sure your nieces will love them. I know I do!!!! I love the little Easter basket. I seem to be having trouble downloading the pattern. It says it's not supported by a file? I am using a Mac should I be doing something different? Thanks for your help, can't wait to get started making my baskets. Thank you for sharing. Karen...since I don't have a way to contact you hopefully you will see this. I am not sure what the problem is. You do need the Gypsy to be able to cut the file. I wouldn't think that the MAC would be the problem. Please let me know if you are still having trouble with this. Oh, what sweet baskets, Juliana! I just LOVE them! the baskets are really cute, baby girl. see you sat. Absolutely precious! Thanks so much for sharing with us.